There is the classic story of someone pulling up the mangy carpet in their home and finding gorgeous hardwood floors. This is an exciting anecdote because hard wood flooring can have a transformative effect on the room in which it is present. It adds a certain amount of style and sophistication to the aesthetic of a home. But what some may not realize is that it is actually an environmentally conscious choice to have hard wood in the home as well. It’s not difficult to see why hard wood flooring is superior to some of the alternative options. The production of steel, for example, results in up to 40 times more pollutants than the manufacture of wood. Additionally, brick and concrete result in four and six times as many pollutants respectively. Wood is also responsible for far less carbon dioxide emissions than these other materials. While other materials clog land fills with their excess solid waste, the excess wood from manufacturing can go into the creation of other products. Wood is also a better insulator for the home. Since the structure of wood naturally traps air, there is less worry of unwanted air leaking in or out of the house through the floors. The correlation between concrete and wood in this area is staggering, as it takes 15 inches of concrete to provide the insulation qualities of 1 inch of wood. 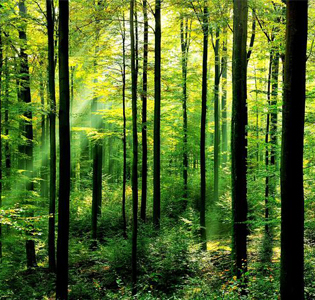 It is a misconception that the manufacture of hard wood flooring is detrimental to the forests in this country. In reality, wood manufacturers are heavily invested in the growing of trees to ensure that they still have a product. North America has more than 70 percent of the forest cover that was here in the 1600s, and the geographic area that encompasses the United States today has a greater extent of forest cover—one-third of the land mass—than it did in 1920. These companies also take care to protect older forests and focus on the newer ones that can be regrown quicker. So by purchasing wood flooring, you are showing these companies that there is value in wood, and that they should not cut them all down and start growing something promising a bigger profit. When choosing hard wood flooring, you are supporting the forest population in this country. You are getting more insulation for less waste. You are enjoying easier clean up that takes less chemicals than carpet or other alternatives. And all the while you have a classically stylish floor that is sure to never go out of style. Shelterwood’s recent remodeling project is currently utilizing hardwood floors to add aesthetic appeal to a home in an environmentally conscious way. But perhaps hard wood flooring is out of your budget. Another option to consider is bamboo, which is less expensive and has even less of an impact on the environment. Either way, when purchasing a new home or remodeling an existing place, hard wood flooring should be near the top of the list of things to consider as an upgrade. It’s easy on the eyes, and even easier on the conscience.